Fritter Batter 2 eggs 1 tbsp oil 1 c. flour 1/2 c. cold water 1 tsp. salt If for sweet fritters, 1 tsp. sugar & 1 tbsp of brandy. 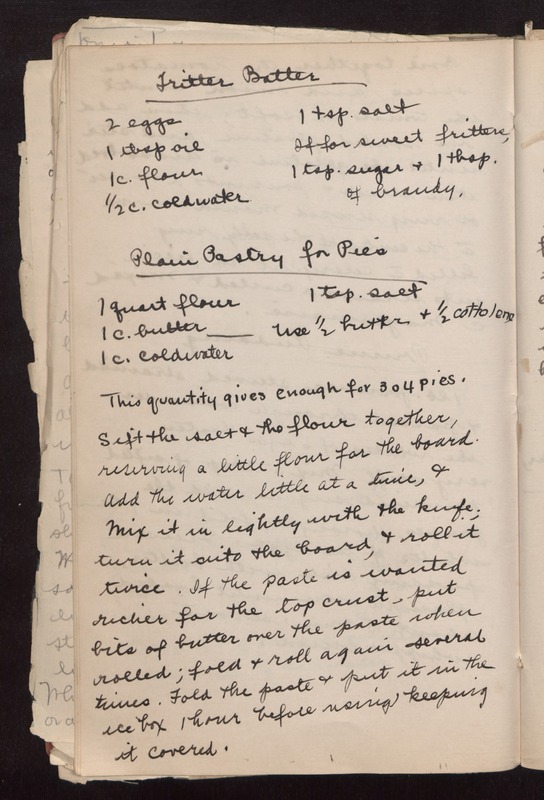 Plain Pastry for Pies 1 quart flour 1 c. butter - use 1/2 butter & 1/2 cottolene 1 c. cold water 1 tsp. salt This quantity gives enough for 3 o 4 pies. Sift the salt & the flour together, reserving a little flour for the board. Add the water little at a time, & mix it in lightly with the knife; turn it onto the board, & roll it twice. If the paste is wanted richer for the top crust, put bits of butter over the paste when rolled; fold & roll again several times. Fold the paste & put it in the ice box 1 hour before using keeping it covered.